I know I've said this time and time again, but, creating the work environment that is prone to self-fulfillment, as per Maslow's Hierarchy of Needs, is probably one of the most important areas that the leader needs to focus a great deal of time and energy. You can have a great benefit or compensation package, you can have flexible work hours, free coffee, ergonomic chairs and everything else that one may think of, but if you don't have a good working environment your employees will more than likely go work for another company or worst will be de-motivated to work for you! As I'm sure you've heard before, people leave supervisors not companies. Therefore you need to make sure that their individual work environment is one where they feel valued, empowered and respected so that they will give you and the organization their fullest attention and dedication. This is important because it will provide them with a sense of fulfillment; it will not make them feel like they are simply exchanging time for money. Well, these are pretty popularized in term of employee recognition that will promote a sustainable employee motivation. So I won't expand much on them. Just a few important point. First, don't justify given one to remove the other. This means, don't put yourself in a position, where as the leader, you will be having the following conversation, "Well Bob, you did a great job this year and I gave you a Bonus for it, so I'm sure you understand that this explains why you are not getting a raise this year." Or, "Well Bob, since you just got a pay increases with your promotion, you are not getting a pay increases this year." Put yourself in Bob's shoes, yes, you might understand, but at best, you would have small residual sense of dissatisfaction. At worst, you are demotivated because you feel that you didn't at least get the cost of living increase and that the increase you received was for the extra workload and extra responsibilities. 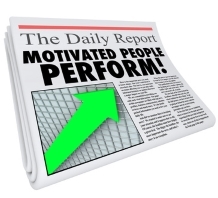 Regardless of the rationalization, you, as the leader, have a great responsibility to ensure that you have sustainable employee motivation and not just sporadic one. Even though you don't have direct impact on ensuring that the benefits and compensation are above average industry, there are certain things that you as a leader can do with regards to preparing yourself for such a conversation with your staff. For starters, you can take the time to have a conversation with your human resources representative and actually see where your organization falls compared to the industry averages. You might actually be surprise, and see that you are above or in the average. Even if you are actually below the industry average you can prepare yourself to have a direct conversation, with regards to the benefits and compensation of your organization. Remember, benefits and compensation are an element to sustainable employee motivation, however, it is not the only element and as such you as a leader need to be able to present and justify, without using farfetched analogies, the position of your organization. This is where you need to sharpen your sales skills. In addition, I would highly recommend that this be an individual conversation as opposed to a group session. The reason being, that every one of your employees might have a different situation, for example one could value the location of the workplace or even the flexible hours. In addition, I would also recommend that you only address this topic when it is brought up by your direct report and/or if you feel that the benefits and compensation are a sore point for one of your staff. Many think that talking about training and development requires funds; the reality is that there is a multitude of free training resources on the Internet for a wide array of topics. All you need to do is search for it. Paid training plans are definitely useful and they most likely allow some structured learning as well as some form a validation that the material was acquired and retained. They also enable one to acquire a certain level of guaranteed that the materials being trained out are accurate. In many cases they also allow to get a certification that can be recognized in the market. That being said, it does not mean that free resources are useless and we cannot derive positive values from it. For small organizations that don't necessarily have a substantial training budget, the free training resources available to you might just be your life saver. Invest the time, to research it and structure it and you as well as the organization will reap the benefits. Coaching your employee can not increase your staff motivation, but will develop a culture of sustainable employee motivation. If you take the time to really coach your employee through a specific issue or problem it will not only reduce his or her stress level, but you will increase the chances of success, benefit benefiting both the organizing and the individual. In turn this will increase his or her self -confidence to take on the next challenge with a renewed level of self confidence. A great coaching leadership style should be similar to the Servant Leadership Style. Mentoring is another way of increasing job motivation for your staff. Schedule an hour a week for each of your direct report to sit down and have a coaching session, where your employee can relate to you some of the difficulties that he or she is experiencing and is day to day activities. Then provide some advice that will either help them overcome these difficulties or provide some guidance that will enable him or her to think of ways to overcome these difficulties. Just remember, if you don't have the answer don't try to make one up, as doing so, will only result in a loss of trust and you're employee will not be seeking any further advice from you or he or she will simply pay your lip service as to how useful your coaching sessions are, which will be a total waste of time for both of you. Social committees, if you don't have one in organizing, I would highly recommend you create one as they are the most free and fun way to enable a sustainable employee motivation culture. We are social beings; we need to feel like we're part of a society, we need to have a sense of belonging and developing that sense of belonging towards your organization will increase job motivation and should be, in part, the responsibility of the social committee. As the leader, you also have a social role to play and one of your responsibilities is to ensure that the social committee is performing its function of organizing activities that will foster a spirit of belonging to your organization. Your second role with regards to the social committees is to make sure that you promote and participate in the organized activities. After all they should be designed to have fun as well as to have the opportunity to bond with your staff in a different context. Lastly, these activities can be as simple as a potluck where everyone brings food to share with their coworkers or it could even be playing a game of soccer outside. The point is, to have social activities doesn't require much money to be spent. I hope that this article help you visualised some ideas for creating a sustainable employee motivation culture within your organization. As a last word, I would like to say, work for you employee and they will work for you!